The International Football Association Board (IFAB) says Champions League games will have two extra assistant referees next year. The system was tried in last season's Europa League and will be retained there and used in Europe's elite club competition for the next two years. 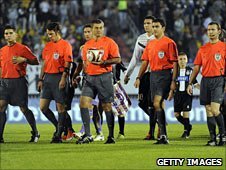 The refereeing experiment will allow Fifa to take a decision on its long-term viability in 2012. Goal-line technology will be discussed at the IFAB's next meeting in October. Other tournaments in Asia and South America will also try out the extra officials system. Is this a good idea and should other competitions follow suit? Fifa president Sepp Blatter has long been a staunch opponent of using technology to help referees make decisions, but the outcry over high-profile mistakes such as Frank Lampard's disallowed goal in England's World Cup loss to Germany seem to have caused a softening of the official stance. Fifa general secretary Jerome Valcke told BBC Sport the Lampard incident, where the ball hit the underside of the bar and clearly bounced down over the line, before bouncing away and no goal being given, had been "a bad day" for tournament organisers. He also said the 2010 World Cup would be the last "under the current refereeing system," without giving further specific details.